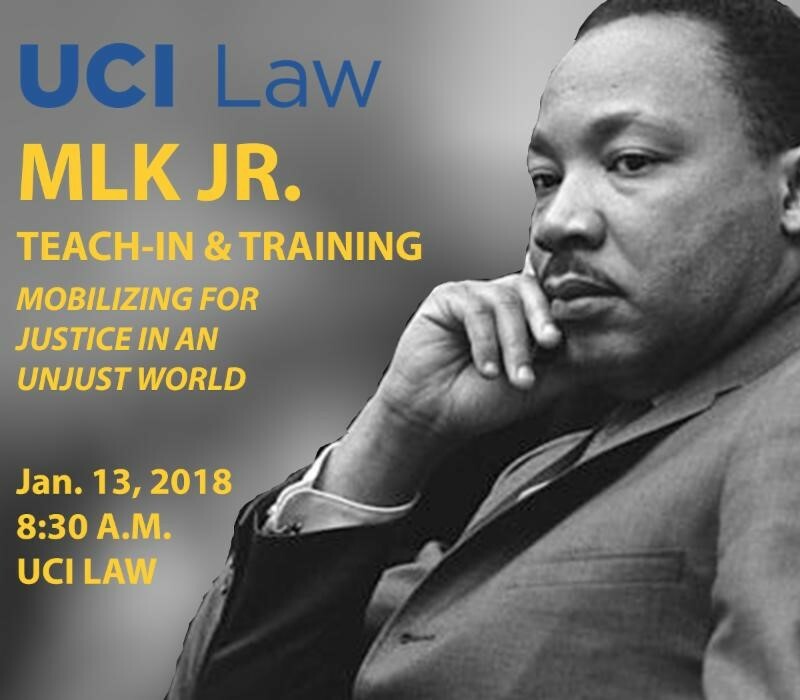 Established in 2017, the Martin Luther King, Jr. Teach-in & Training at UCI Law provides an opportunity for faculty, staff, students, alumni, and local attorneys to come together to discuss opportunities to advocate for justice in a variety of legal practices. The event involves not only discussion, but also a call to action for those concerned about the effects of those current government decisions at local, state, and national levels that impact civil rights; the criminal justice system; immigrants; housing; education; cybersecurity; and the rights of organizers to speak and assemble. Training will be provided for attorneys and community members interested in serving as Legal Observers at demonstrations and other events held around Southern California where protesters and/or event organizers are concerned about First Amendment rights. The plenary session will be recorded and made available to the UCI Law community within 72 hours of the event. Breakout sessions, however, will only be recorded upon request and with the permission of the panelists. Session 1 (Choose 1) 9:45 a.m.–10:45 a.m. Session 2 (Choose 1) 11:00 a.m.–12:00 p.m. This event includes sessions approved for Minimum Continuing Legal Education Credit by the State Bar of California. UC Irvine School of Law is a State Bar-approved MCLE provider. For more event details, or to request reasonable accommodations for a disability, please email UCI Law Events Manager Jillian Henry at jhenry@law.uci.edu.